Review by AllTheBestFights.com: 2016-04-02, pretty good fight between Juan Carlos Sanchez Jr and Edivaldo Ortega: it gets three stars. The former Ibf super-Flw champion Juan Carlos Sanchez Jr entered this fight with a boxing record of 21-4-1 (9 knockouts) and he is ranked as the No.18 super bantamweight in the world. He lost to Cesar Juarez last year (=Sanchez Jr vs Juarez) but then he beat Jhon Gemino. His opponent, the undefeated Edivaldo Ortega, has an official record of 23-0-1 (11 knockouts) and he entered as the No.16 in the same weight class. He has already fought once in 2016 winning over Alexander Cazares. 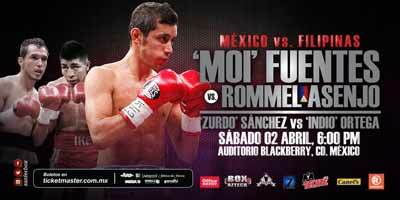 ‘Zurdito’ Sanchez vs Ortega is on the undercard of Moises Fuentes vs Rommel Asenjo. Watch the video and rate this fight!